On 17th October IIMA attended the event organized by UNRISD, the United Nations Research Institute for Social Development, called “Walking the Talk: Transformative Pathways for Achieving the SDGs. The conference focused on the 2030 Agenda for Sustainable Development and the Sustainable Development Goals (SDGs) as a global commitment to “transforming our world” and “eradicating poverty in all its forms everywhere”. The panelists discussed about the progress that has been achieved until now. They underlined also the need to address the causes of the inequitable outcome, creating specific innovation policies and new practice that would lead to social, economic and ecological justice. Mr. Paul Ladd, UNRISD director, together with the other panelists, talked about the UNRISD 2016 Flagship Report. This document gives to government and society a new definition of transformation that could be a standard for creating policies for the 2030 Agenda, respecting the imperative of “leave no one behind”. The 2030 Agenda address his attention to the global challenges of today: poverty and hunger; climate change; health epidemics; migration, flight and displacement; unsustainable growth and economic crises; inequality; social exclusion; lack of decent work and social protection; political instability as well as insecurity and violent conflicts. 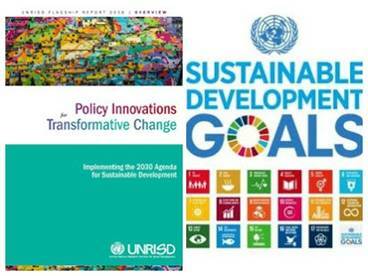 The team of researchers of UNRISD has put together five years of research across six areas –social policy, care policy, social and solidarity economy, eco-social policy, domestic resources mobilization and politics and governance – showing how these policy fields could have impacts for the success of the 2030 Agenda. These six starting points are the basis to create reforms and governmental policies that will need to attain the seventeen SDGs. These points must be translated into local, national and international levels. They gave also six guidelines to evaluate the “action toward transformative change”: the first emphasizes the need to receive more investments in research on innovative ways; the second shows the importance of using an eco-social lens to design measures to combat climate change, while the third should design institutional frameworks in relation to the principles of universalism, human rights and social justice. Moreover, the fourth point refers to the necessity to promote political participation and empowerment through inclusive and transparent political processes; the fifth argument underscores the need to reverse the existing normative hierarchy to position social and environment priorities above economic ones. Finally, the last point addressesthe importance to re-embed markets in social and ecological norms, respecting all the planetary boundaries. The conclusions of the panel stressed the need of involvement of multiple actors who “walk their talk” in terms of commitment and of translating their vision into visible and measurable changes. This requires the monitoring, evaluation and implementation of actions taken by the policy makers at all levels; redressing power asymmetries and inequalities; altering the existing international power relations; empowering vulnerable groups and promoting their political participation; and, finally, reversing the norms and values that subdue social and environmental goals to the economic objectives.